A train company is to double the amount of compensation it pays season ticket holders after failing to meet its punctuality and reliability targets. First Great Western (FGW) apologised for poor service and said it would also freeze fares and car park charges until the end of the year. Most season ticket holders are expected to pay the previous year's prices when they renew their 2008 ticket. The move comes days before a planned fare strike by disgruntled passengers. Pressure group, More Train Less Strain, said it had received widespread support for the protest scheduled for 28 January across the West Country. Under the terms of the Passenger's Charter, if reliability and punctuality targets are not met, season ticket holders receive a refund of 5 or 10% of their ticket value, which FGW is doubling. This could mean a commuter rebate of as much as £800 in some cases. Weekly season and day ticket holders will also be able to claim double compensation over the course of 2008 if their service is significantly delayed or cancelled. Andrew Haines, from the company, said: "We've not given customers the service they deserve over the last 12 months, and we're sorry. "We want to do the right thing by our customers. We are working with Network Rail to help us deliver a better service, but I recognise the promise of a better service tomorrow is little consolation for poor performance. "I want this to send a clear message that we take our performance commitments seriously." 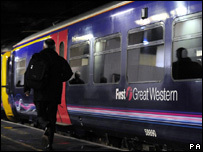 Another pressure group, Ox Rail Action, said it welcomed First Great Western's apology. Zahra Akkerhuys, from the Oxford-based group, said: "We feel this is a step in the right direction and a real acknowledgement of the poor performance of the First Great Western service. "But we still need to see more action to make sure trains run on time and the performance improves." Ms Akkerhuys added the lobby group would "look at the small print" and consult with More Train Less Strain before deciding whether to go ahead with Monday's planned fare protest.